I’ll freely admit it. Indiana Jones and the Last Crusade was the first and only film of the series I have seen. 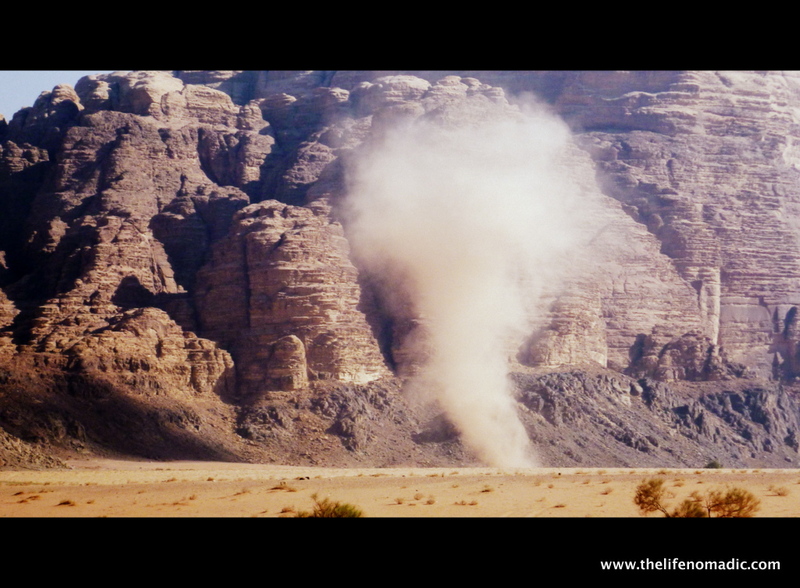 I liked it for what it was, a slightly cheesy action film, but I really enjoyed it for what it inspired in me, a reason to visit Petra. The beauty of The Treasury and the rest of the complex that was shown in the movie sparked a flame that was one of the few of my early bucket list items that hasn’t changed. Fast forward more years than I’d care to admit and I was on a flight bound for Amman. As has been our typical travel style this year we had only a weekend to see this beautiful country. I understood that I would likely leave with a feeling of want, and I did, but so many things about that weekend made it very worthwhile. Here are a few of them. 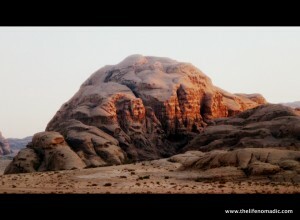 Part of our jam-packed weekend schedule was an overnight experience in Wadi Rum with Bedouin Directions. Everything about our time with them was seamlessly beautiful, from the desert hike at sunset to the dinner and music by gaslight. But the jewel in that crown was as simple as dragging our cots out of the tents and into the evening shadows. Snuggled up against the slight chill, I watched the stars come alive. Brilliantly vibrant against an inky sky, I fell asleep counting constellations and revelling in the utter and complete bliss I felt in the moment. I gleefully dubbed my photo series of Wadi Rum “Beauty and the Bleak”. This stunning UNESCO World Heritage Site is everything I had ever hoped for in a desert landscape. Unique rock formations, towering cliffs, dunes of myriad beautiful colors, and vistas that literally took me back in time all combined to make for an exquisitely perfect day. Our guide and his trusty Jeep had me squealing like a little girl as we raced over the dunes, we climbed through the rubble of Lawrence of Arabia’s house, I got up close and personal with ancient petroglyphs, and witnessed an incredible dust tornado the size of which I had never seen. I easily could have pitched my own Bedouin tent and stayed in Wadi Rum forever. 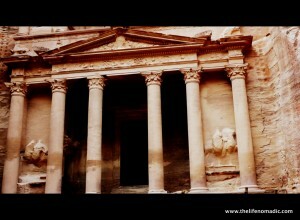 What can I say about Petra that hasn’t already been said many times over the last two thousand years? 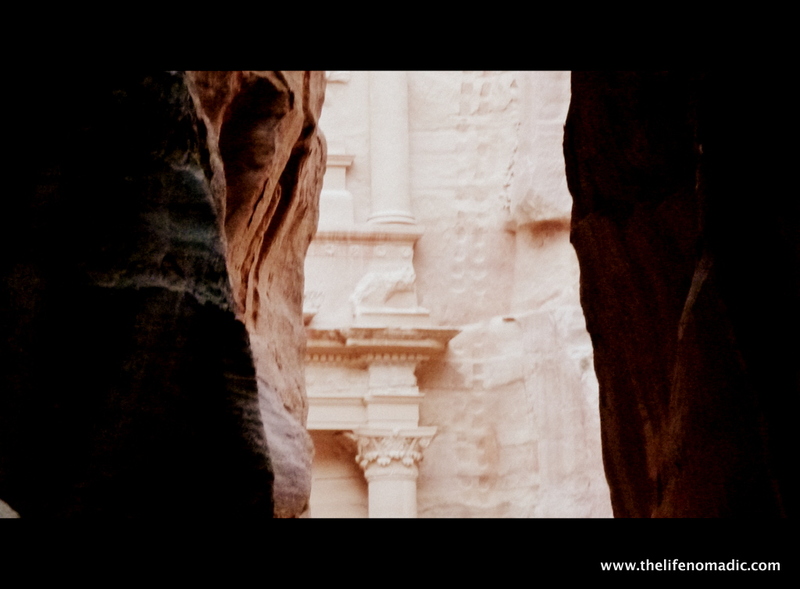 The first glimpse of the Treasury as we neared the end of the Siq is a humbling experience, to say the least, but to stand in front of The Treasury, head tipped all the way back to take it in, is a feeling of awe that will be a touchstone of mine forever. Add to that the rest of the complex, the gorgeous striations in the pink sandstone, and the soaring expanse of the many cliffs made me feel so small, and so grateful to be there. 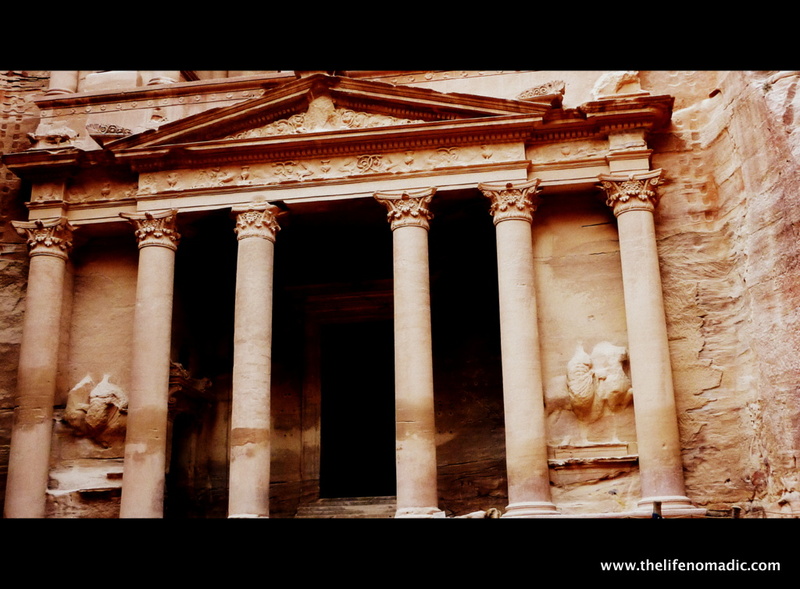 Petra is a place of huge cultural significance and although I say this a lot, it is a place that no one should miss if you have the opportunity to go. 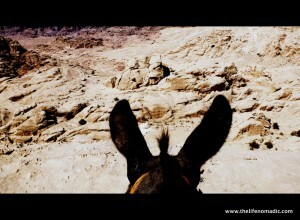 So this guy at Petra really wanted us to have a ride on his pair of donkeys. He trailed us all through Petra and we eventually agreed, more to just get him off of our backs than anything. As we discussed the route we would take, he mentioned a secret way to get back to the parking lot near the entrance to Petra. Thus began an epic sixty minute journey across an area that only goats get to see on a regular basis. 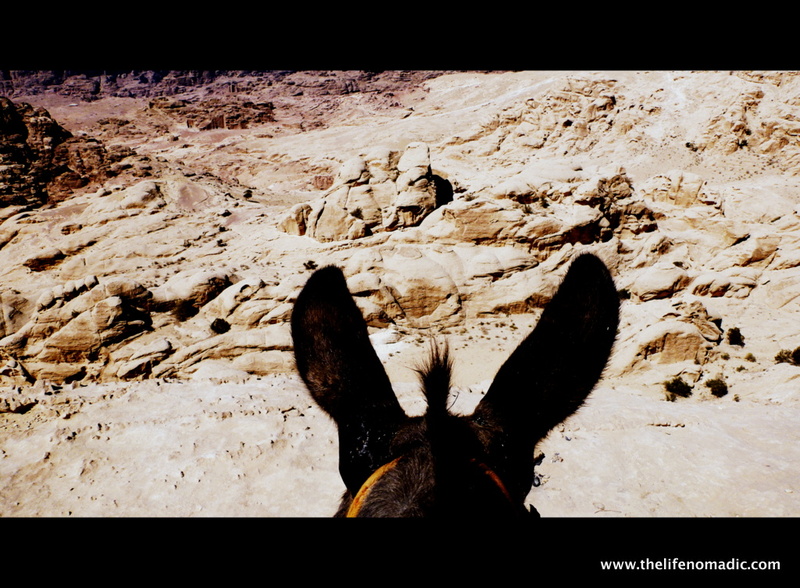 Those strong little donkeys scrambled up and over the rock formations and as the bright sunlight bounced across the cliffs and reflected back on Petra, I was again lost in a moment that felt very much like a dream. Throughout our entire weekend in the country of Jordan, as we raced in our rental car from place to place, I was flush with emotion. The landscapes are gorgeous, the people are intelligent and generous, especially with their tea, and the history is something to be savored. I can’t wait until we have a chance to return and really get to know this enchanting place. 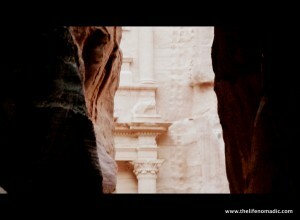 Have you visited Jordan? Would you like to? Let us know in the comments section below!